Like Willow to the north, Oak station was not part of the original plan of the Northwestern Elevated Railroad as built in 1896-1900. The addition of a station at Oak Street was included in the franchise provided by the city to build the Northwestern Elevated's Ravenswood branch, as was the addition of a stop at Willow Street. Although these stations were not located on the new branch, the city used the Northwestern's desire for permission to build and operate the new spur as leverage to force the "L" company make the otherwise unrelated improvements. Oak station opened in 1906. 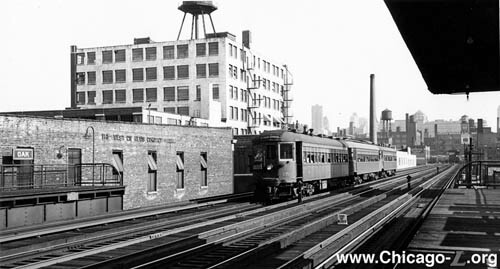 The station house was located on the south side of Oak Street, underneath the elevated track structure. It is uncertain what the station house looked like, although its footprint suggests it either resembled Willow's small Craftsman-style building or the masonry station houses built for the elevated portion of the Ravenswood branch, all of which were built at approximately the same time and mandated by the same franchise. Oak featured dual side platforms, constructed of a wood deck on a steel frame. The platforms featured canopies covering most of the platforms, beginning at the north ends of both platforms and extending about three-quarters of the length southward. Despite being built six years later and contemporaneously with the Ravenswood branch (which had a different design), Oak featured railings typical of the original Northwestern Elevated facilities, with tubular frames and posts with panels of decorative, vaguely diamond shaped metalwork inside. 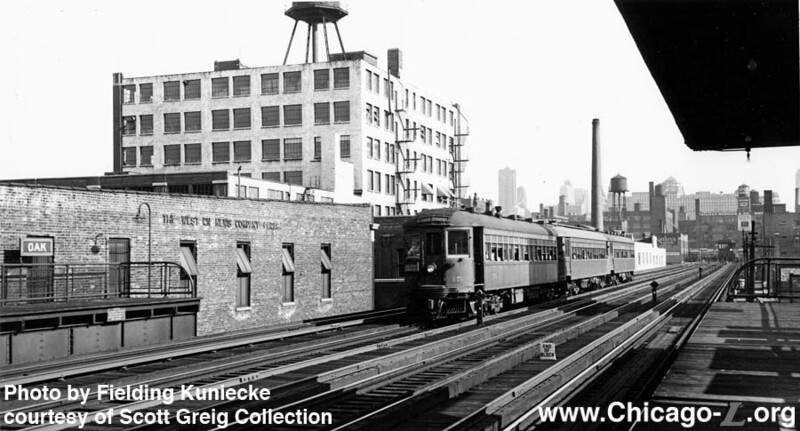 Oak briefly survived the CTA's 1947 takeover, but was one of 23 stations closed in their North-South Route service revision August 1, 1949, which included the closing of several other stops on this line including Division, Larrabee, Schiller, Halsted, Webster, Wrightwood and more. The concept of "local" stations, of which Oak's low usage was only suited, was not a part of the A/B skip stop concept and the station was closed. Some have conjectured that Oak and other stations in the Near North area may have been closed because of or to discourage patronage by public housing denizens. This theory, however, is almost certainly untrue, if for no other reason than pure chronology: the only Cabrini housing there in 1949 were the Frances Cabrini Rowhouses, built in 1942. Known at the time as "Little Sicily," this development served as a stronghold for the city's Italian-American community and, under Elizabeth Wood's leadership (1937-1954), the Chicago Housing Authority's developments were relatively safe, well-maintained places, making them unlikely sources for crime or disturbances. The high rise towers, formally known as the William-Green Homes, and the CHA policies and issues of the high-rise era didn't come to Cabrini until many years after the stations closed. So it seems unlikely that the public housing was the reason that Oak and other surrounding stations closed. However, it is acknowledged that the neighborhood around Cabrini and Oak station was quite rough by the 1940s, sometimes called "Little Hell" and consisting of much rundown tenement-style housing (indeed, making it the very reason why public housing was being located there to begin with, to provide new, better housing stock). The state of the neighborhood no doubt made the area unappealing to riders and Rapid Transit employees alike. But low ridership and the desire to streamline the North-South Route were the real, primary reason for the stations' closures. Today, the entire station is gone and nothing of it remains.